Avoiding big investing mistakes is just as important as finding the best stocks to buy. When looking to maximize your returns over the long term, finding the best stocks to buy is not enough. You also need to avoid the most expensive mistakes, as they can have a tremendously damaging impact on your portfolio. In that spirit, Philip Morris (NYSE:PM) and Best Buy (NYSE:BBY) are two companies I'm not planning to buy any time soon. Philip Morris is one of the top players in the tobacco industry, the company owns the rights to the massively popular Marlboro brand outside of the U.S. and China. When including its three main brands: Marlboro, L&M, and Chesterfield, management estimates that Philip Morris owns a leading market share of 38.7% across its key markets. However, like Warren Buffett once said "A horse that can count to ten is a remarkable horse, not a remarkable mathematician." Philip Morris may be one of the best companies in the tobacco sector, but this does not make it a solid investment. Tobacco consumption around the world is on a long-term decline, and this is a major consideration to keep in mind. Philip Morris' total cigarette sales volume declined 5% in 2013, 3% in 2014, and 1% in 2015. During the first quarter of 2016, Philip Morris reported a 1.4% decline in volume excluding acquisitions, and management is expecting industrywide volume to fall by 2% to 2.5% during the full year 2016. The company is buffering the decline in sales volume with strong pricing, while sales in U.S. dollars fell 8.1% last quarter, constant-currency revenue excluding excise taxes increased 2.4% year-over-year. Similarly, reported earnings per share fell 15.5%, but earnings per share adjusted for currency fluctuations increased by a modest 0.9%. Nevertheless, it's hard to tell for how long this strategy will continue to work, as the company just can't keep raising prices indefinitely. As long as tobacco demand continues declining over the years, this could sooner or later inflict considerable damage on Philip Morris, so investing in the tobacco giant can be hazardous to your wealth. The e-commerce revolution is here to stay, as consumers around the world are increasingly going online to purchase all kinds of products and services. 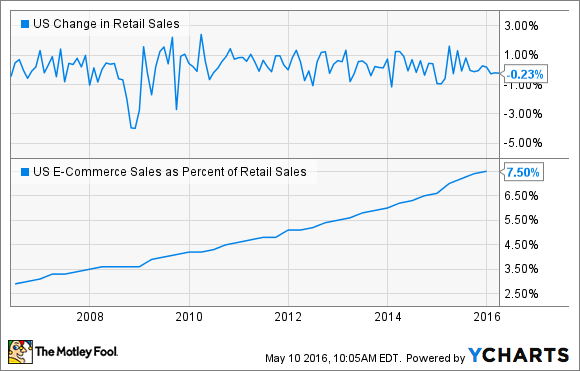 The following chart shows two crucial variables for retailers, the modest growth in U.S. retail sales over the last several years and the increasingly growing share of retail sales happening online. The conclusion is quite clear, online is the name of the game in the retail industry nowadays. Best Buy is mostly focused on electronics, and this product category is particularly vulnerable to changing consumer demand. Consumers tend to look for information online, and then maybe they take a deeper look at the products in a physical store, but they ultimately buy electronic devices at the store, physical or online, which offers the most competitive price. This is putting tremendous pressure on profit margins across the industry, and it's hard for Best Buy to compete against an online juggernaut such as Amazon (NASDAQ:AMZN). Best Buy is actively focused on online growth, and the company is reaping some benefits in this crucial area. Domestic online revenue during the quarter ended in January was $1.95 billion, an increase 13.7% on a comparable basis. As a percentage of total domestic sales, online revenue increased 200 basis points, from 13.6% in the same quarter last year to 15.6%. On the other hand, Best Buy is still no match to Amazon in terms of size or growth. Amazon reported a huge $29.1 billion in sales during the first quarter of 2016, an annual increase of 28% in U.S. dollars and an even bigger jump of 29% in constant currency. Looking only at electronics and other general merchandise sales in North America, Amazon produced $13.5 billion in sales last quarter, a powerful increase of 32% year-over-year. Best Buy is a financially solid business, and management is doing a sound job at investing for online growth while at the same time keeping overall costs at bay to protect profitability. However, the company is fighting an uphill battle against Amazon in online retail, and this is quite a formidable challenge.